According to the U.S. Department of Education’s Office of Civil Rights (OCR), Binghamton University has the second-highest number of civil rights violations and corrective changes of all the schools in the State University of New York (SUNY) system. Over the past three and a half years, 17 civil rights cases were filed against BU with the OCR and resolved. Of those cases, four resulted in resolutions with violations or corrective changes. All of BU’s cases that were resolved with violations or corrective changes involved discrimination on the basis of disability. In the cases where the University felt the need to voluntarily make a corrective change, it is possible that the administration feared the violations it could possibly face if the OCR conducted a full investigation. Moreover, even when all the cases were resolved, there is no evidence that the individuals involved in the complaints ever faced any disciplinary action. The number of cases filed against BU is already shameful enough, but on top of that, the SUNY system has seen a very high number of cases filed against its schools compared to similarly sized university systems in the United States. The SUNY system had a total of 340 cases filed against it, and 77 cases were resolved with violations. In comparison, the University of California system had 158 cases filed against it with 12 resulting in violations, and the University System of Ohio had 191 cases filed against it with 17 resulting in violations. It is abhorrent that the SUNY system has seen such a disproportionate number of civil rights cases filed against it. The SUNY system has enjoyed a great reputation as providing students with a top-notch education at a low cost, which makes it enticing to prospective students. Given its stellar reputation, one would think that SUNY would make it a priority to comply with federal guidelines on how its students are treated. However, Pipe Dream’s investigation makes it clear that this is not the case. This, coupled with the knowledge that SUNY has been warned in the past about its failure to comply with federal guidelines, is completely unacceptable. SUNY’s indifference on the matter is further solidified by the fact that, when the Editorial Board contacted SUNY with three specific questions regarding the high number of violations, we received only a three-sentence response that failed to directly address any of the questions asked: “As the largest public higher education system, The State University of New York strives to offer a safe and inclusive learning environment. The prevention of sexual harassment and assault and discrimination of any kind is a top priority. We have been working to provide resources and encourage students and faculty to make us aware of any issues. We also have ongoing partnerships with government agencies and non-profits to develop better policies, resources and trainings.” The Editorial Board feels this generic response displays a lack of urgency about civil rights complaints, which is extremely discouraging. SUNY should be doing more to prevent civil rights violations from ever happening in the first place. As for BU, the Editorial Board is concerned over the lack of response to Pipe Dream’s investigation, both on the part of the administration and of students. The University has yet to make a public statement about its ridiculous number of civil rights cases and does not appear to be releasing one anytime soon. The administration should be proactive in addressing instances of wrongdoing on its part, and it should not take students demanding it make a statement for it to do so. The onus should be on BU to make sure students feel protected here and to ensure that appropriate changes are implemented. In particular, the Services for Students with Disabilities office (SSD) must do more to ensure appropriate accommodations are arranged for students with disabilities. To do so, there needs to be better communication between the SSD and professors at the University. Clearly, the University must place more of a focus on accessibility. Aside from the administration, BU students have also appeared apathetic toward these civil rights cases. The Editorial Board maintains that all students should be concerned about the violation of any student’s civil rights. We stand in solidarity with the students hurt in these cases, and we urge our fellow students to do the same. We are specifically disappointed that BU Council Representative Harry Bittker did not mention the cases at the recent BU Council meeting, illustrating the apathy of the student body. The reality is that it seems like the administration never takes action unless its reputation is at stake; it takes student action for it to do something. Both BU and SUNY seem to have a track record of failing to learn from their past mistakes, but the Editorial Board hopes that this changes soon. In order for the University to care, students must also show they care. 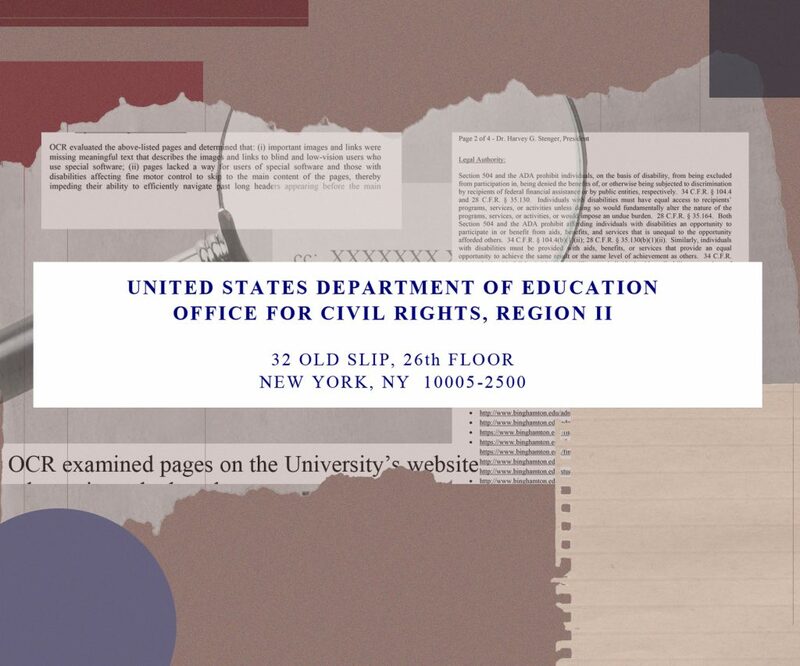 We urge everyone to take a look through Pipe Dream’s SUNY Collegiate Civil Rights Record (CCRR) database to learn more about the violations. We must show the students impacted that their experiences matter, and that the University will not get away with violating even one person’s civil rights.